The Gophers, led by speedy point guard Deandre Mathieu, said this week they plan to make the Badgers run in Wednesday night's game at Williams Arena. MINNEAPOLIS — In years past, the Wisconsin Badgers would beat opponents by boring them to death. Badgers coach Bo Ryan runs a system that thrives on patience. Wisconsin’s players on previous teams would often hold the ball until the 35-second shot clock neared zero. It wasn’t uncommon for the Badgers’ final scores to be in the 50s, or even the 40s. Such was the case last year when UW beat Minnesota by a painstakingly low final score of 45-44. The Gophers were held to just 20 points in the second half, thanks in part to Wisconsin’s deliberate pace of play. That is not a tempo that this year’s Gophers squad likes to play at. Fortunately for Minnesota, it may not have to when the Badgers come to Williams Arena. Entering Wednesday’s matchup, Wisconsin is actually scoring at a higher clip (75.8 ppg) than Minnesota (75.1). For those hoping for a low-scoring affair, prepare to be disappointed. "Wisconsin’s always had some talented teams, but this year they have the most talent that I’ve seen," said Gophers senior Austin Hollins. "I think it’s better for them to play fast-paced. They don’t always play fast-paced. They slow it down when they need to. When they do slow it down, they’re going to use all the shot clock. But I think it’s in their favor to play fast." During the last three meetings between these two teams, neither squad cracked the 60-point mark. Under first-year head coach Richard Pitino, Minnesota has yet to have a game below 60 points. Pitino’s style of play works best when the Gophers are getting up and down the court quickly. Sometimes, Minnesota’s best offense is a good defense that forces turnovers that lead to easy baskets in transition. The Badgers teams of old may have prevented such a track meet from occurring, as Wisconsin typically forces teams to play at its pace. No matter how much a team wanted to push the tempo, the Badgers made it difficult to do so. Minnesota believes it should have no problem running against this year’s version of the Badgers, who themselves have shown a fondness for up-tempo games. "As long as we get 61 and they get 60, I don’t care what we do," Pitino said. "You take what the opponent gives you. I’d like to play fast, but I don’t want to play dumb, either. I want to be smart with how we’re playing. But as long as we win, I don’t care what the score is, really." The Gophers, coming off a loss at Iowa, will host a wounded Badgers team Wednesday night. After a 16-0 start to the season, Wisconsin has lost its last two games. UW fell on the road to Indiana before getting upset at home against Michigan. Even in those defeats, though, the Badgers’ pace of play was quicker than it was in years past. Through 18 games, Wisconsin is averaging 10.8 points per game more than it did a year ago, when UW scored 65.0 points a game. The reason for Wisconsin’s offensive explosion this year? Pitino cites the athleticism of the Badgers’ lineup from point guard Traevon Jackson all the way UW’s big men like 7-footer Frank Kaminsky. "They certainly were playing very, very fast early," Pitino said. "They’ve got talented offensive players, certainly. Not that they’re a bad defensive team; they’re a very good defensive team, too. But one through five on the court, especially with a kid like Kaminsky, that added dimension . . . it’s hard. They’re really hard to guard, just because every guy can pass, every guy can shoot. . . .
"If they have a shot on the break, they’re going to take it. If they don’t, they’ll be patient." Given the speed of this year’s Gophers team, led by quick point guard DeAndre Mathieu, there’s little question that Minnesota will try to push the ball up and down the court Wednesday against ninth-ranked Wisconsin. This year, however, the Badgers might try to do the same. "I think we can run with them. We can make them run," Hollins said. "I know they like to run, but we like to run, too. It’ll be a pretty evenly matched game." 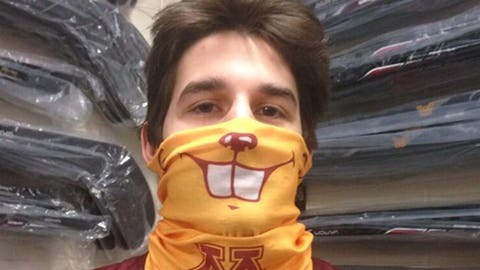 Shell lands a scholarship: Gophers junior guard Kendall Shell has played just 39 minutes and scored six points in his career at Minnesota. In some ways, those numbers epitomize life of a walk-on athlete. Yet on Tuesday, Pitino announced that Shell will be placed on scholarship for the spring semester. For Shell, the long wait and the hundreds of hours of practice have paid off after he wondered if this day would ever come. "At first, I wasn’t sure if I heard what he said right," Shell said. "When he said it, he kind of lined everybody up. Everybody was back there. I kind of had to take it in for a second, but then everybody just started clapping. It just felt good." As a 6-foot reserve guard, Shell’s minutes have been limited to blowouts against nonconference opponents. Typically, he’ll enter a game in the final minute when the game is out of reach. He’s lucky if he even gets the chance to take a shot — he’s only attempted 10 in two and a half years. Yet Shell is still grinding with his teammates every day in practice and provides an emotional lift on the bench. When Pitino took over for former coach Tubby Smith, Shell didn’t know what would happen with his status. Not only did he remain on the roster, but he’s now a scholarship player. "You don’t see it, just because he doesn’t play a lot, but he’s improved more than a lot of the guys on our team," Pitino said. "When he first got here, he was out of shape and just had a long way to go. It’s a testament to him as a kid who has worked extremely hard on his body as well as his game. . . . He will be successful one day in life moving forward. I’m happy for him and proud of him."